There are two things that pretty much anyone learning martial arts can agree on: one, that sparring is great. Two, that shin guards and boots are also great, because getting your kick checked by an elbow hurts quite a bit. It’s almost inevitable that at some point during sparring, usually after a series of kicks, one person will abruptly pause, hold up a hand, and say “Wait, sorry, one second…” Then they struggle, with their gloves on, to readjust a shin guard that’s trying to slip around to the side, or slide their boot back into place. 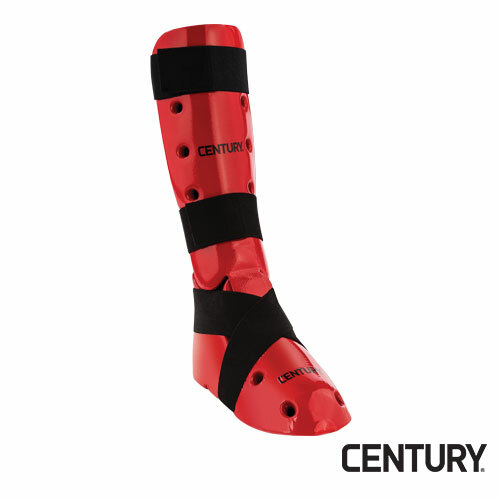 Century’s Convertible Shin Guard was made to keep breaks in sparring or training like this to a minimum, while simultaneously providing extra coverage. The Convertible Shin Guards pair with Century’s Hi-Top Sparring Boots (sold separately). Here’s how the shin guard/boot duo works: the shin guards have an extra little flap at the front, right at the bottom of the guard by your ankle. There’s a small hook-and-loop tab on the underside of this flap. The guards come with two unattached hook-and-loop tabs with press-on backs. These tabs are applied to the boots (you just peel off the back cover and stick them on – no need to risk accidentally gluing your fingers together). Press them onto the top of the tongue of the boot, on the outside, where it will be able to connect with the tab on the shin guard flap. 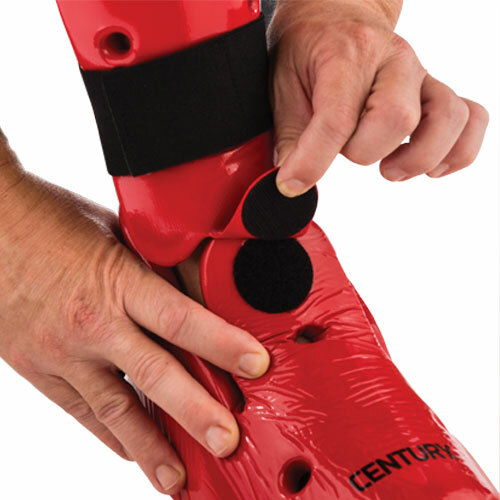 While the guard is attached to the boot, the connected tabs help keep the shin guard from trying to migrate towards your calves. Plus, it provides an extra layer of coverage at the top of your foot/front of the ankle area.